I made myself this birthday card on one of my presents - an art app called Procreate which Vee recommended. (I would tag you if I knew how). It's AWESOME. I am still figuring it out. And we went out to dinner at Applebees and my husband and I had steak! And since he is a veteran he got his meal because of gratitude for his service (read: free) so we could afford birthday dinner, and also new house slippers/shoes for me. Thank goodness we did my birthday stuff last night because a THREE HUNDRED DOLLAR BILL just showed up. hide yo presents! We sortof knew it was coming, so hopefully we can work something out with the situation. Yikes. And I got a surprise birthday present too from a friend, some money for some art I gave away and did not expect a reciprocation for! Such love. 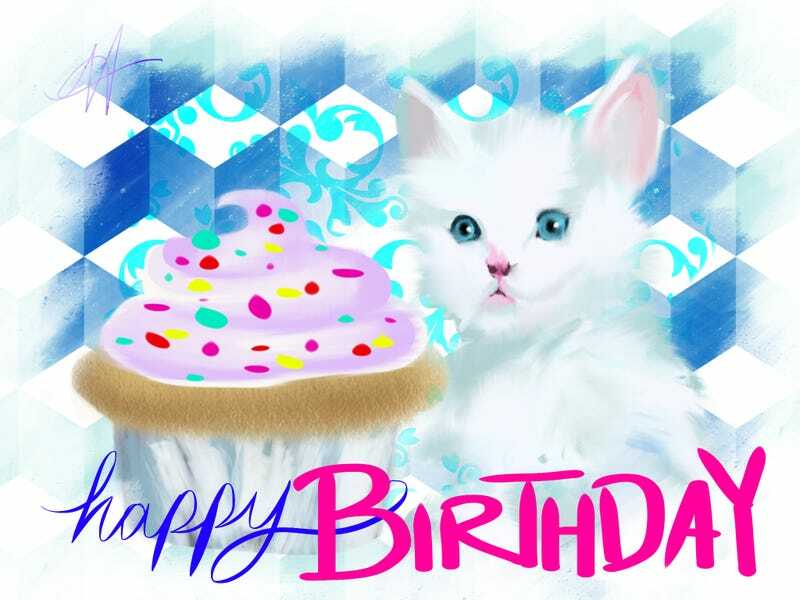 Feel free to print off this birthday cat-cupcake to give as a card to anyone you know whose having a birthday and also likes cats and cupcakes, please let me know if you make use of it. It's kindof odd to make ones' own birthday card, yeah?